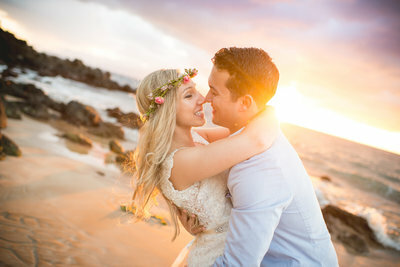 We loved being part of this Maui Venue Wedding! Crystal and Kenny took some time alone for a first look before starting their beautiful wedding ceremony. This is always one of our favorite ideas, it’s a great way to share your excitement with each other before the festivities begin. When Kenny saw Crystal, she was so stunning he could hardly believe she was real! He even gave her a loving touch just to be sure 😉 . After sharing this special moment with her groom, Crystal made her way to find her dad to prepare for the big entrance. Jaslin tossed flower petals to set the path for her mother to follow, we love how sweetly they included their daughter as a flower girl. Jaslin could not have been happier for them! 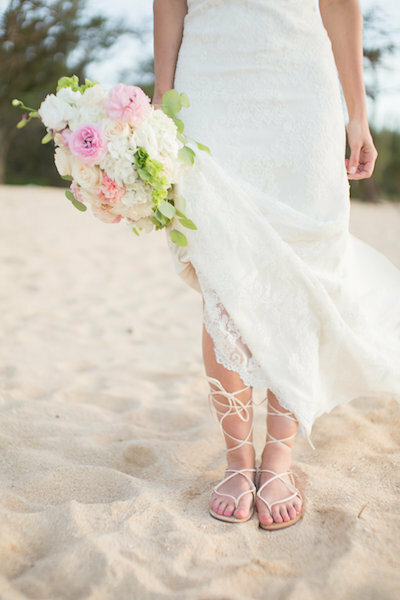 A Maui Venue Wedding at Five Palms is the perfect opportunity to dress up just a little bit more and still take advantage of an after ceremony walk along the beach. This satin mermaid dress with lace detailing fit Crystal like a glove, complimenting all of the right places! The bride also chose a stunning Rustic Hawaiian Bouquet with vibrant colors as the final touch to her elegant wedding styling. We love how sleek Kenny looked in a grey suit and blue tie, it’s always a nice option to be able to take off a jacket and still look put together with a tie in place. These newlyweds looked positively majestic as they walked across the lava rocks next to crashing waves. We would not have wanted to spend our morning any other way than witnessing the marriage of Crystal and Kenny! 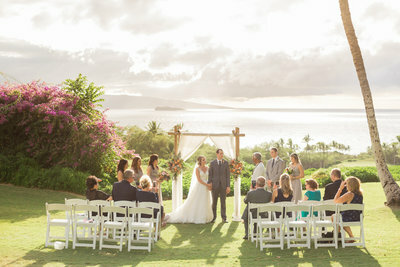 Thank you so much, you two, for including Simple Maui Wedding in celebrating your beautiful relationship and marriage. We are excited for all of the adventures that await you as husband and wife! Congratulations and Warm Aloha!